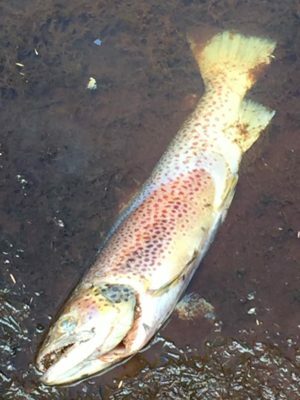 Readers may recall the deaths of Brown Trout in Big Brook Dam during January, believed to be a result of rapidly lowering water levels in the dam to undertake excavation and repair work on the embankment and pipes by the Water Corporation. Neither Recfishwest nor our Freshwater Fishing Reference Group were advised of this repair work. Thanks to the quick thinking of some keen anglers a number of these prized fish were able to be saved, however, many fish needlessly perished. At the time of this event, Recfishwest reported that we would work with relevant agencies to ensure the risk of fish kills were reduced in the future. We are pleased to report that Recfishwest recently met with Water Corporation staff to determine how best we can work together to prevent future fish kills during remedial works on our dams. These fish are a valuable asset that has been paid for by recreational fishers (through licence fees) and when work on our dams is likely to threaten our assets it is only reasonable we are consulted about it. Better consultation and early knowledge of planned work on our dams allows us to take action to significantly reduce the risk of fish deaths. Water Corporation have committed to working in partnership with Recfishwest to ensure early communication of works on our dams, as well as strategies to reduce impacts on fish and fish habitat. Recfishwest is pleased at the timeliness of this commitment and look forward to working together to ensure that quality fishing experiences remain throughout our Southwest. Water Corporation have now committed to an increased level of monitoring of Big Brook Dam whilst the water level remains low and will implement actions such as water aeration should this be necessary to maintain water quality. Recfishwest will continue to monitor the situation and keep our community updated. Water Corporation is installing water aeration pumps to improve oxygen concentrations at Big Brook Dam in Pemberton while it completes essential safety maintenance. A range of mitigation strategies were discussed at a recent meeting with Recfishwest to look at options that would help reduce the impact on fish stocks at the dam when water levels are temporarily lowered. 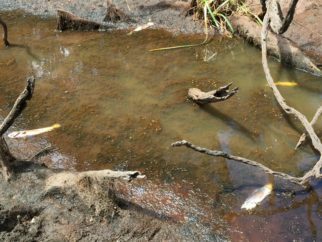 Water Corporation South West Regional Manager, John Janssen said about 30 fish located in feeder creeks had sadly died recently when water levels were lowered to allow maintenance to go ahead. “We are working closely with Recfishwest to help manage any further unforeseen impacts on recreational fishing activity at the dam,” Mr Janssen said. “We will continue to closely monitor the introduced fish stocks in the Big Brook Dam while this maintenance work is carried out. Matthew Gillett, Fishing Development Officer at Recfishwest said it was important to understand that trout would naturally swim upstream and struggle in the warmer weather. 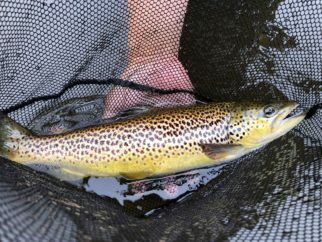 “It is a rare event for more than one hundred more mature Brown Trout to be introduced at Big Brook Dam and fishers were looking forward to catching these. So we will work with Water Corporation to make sure the dam maintenance work can be completed, along with allowing fishing enthusiasts to still enjoy a good catch.” Mr Gillett said. Read the previous updates below. Recfishwest were pleased to meet with the Water Corporation this week, to discuss strategies for reducing the likelihood of impacts on fish and fish habitat in our south west dams. The meeting was extremely positive, with new lines of communication and strategies around increased monitoring and implementing practical mitigation actions discussed. 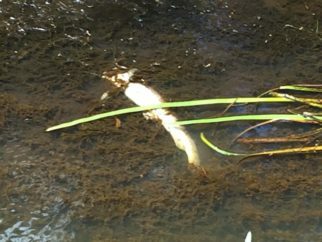 We look forward to working in partnership with the Water Corporation to ensure that events such as the recent fish kill in Big Brook dam don’t happen again. Read the news article in Manjimup-Bridgetown Times by clicking here. Today we have been following up on the deaths of many trophy sized brown and rainbow trout, which appears to be the result of remedial works being undertaken on Big Brook Dam, near Pemberton. We understand that as a result of rapidly lowering water levels in Big Brook Dam to undertake excavation work to repair the dam embankment and pipes, a number of trophy trout were trapped in drying pools. Thanks to the quick thinking of some keen anglers a number of these prized fish were able to be saved. Our southwest freshwater fisheries are already under significant pressure from a drying climate and we understand work on our water catchment dams are essential. However we believe better consultation and early knowledge of planned work on our dams would allow us to take action to significantly reduce the risk of fish deaths. These fish are a valuable asset that has been paid for by recreational fishers (through licence fees) and when work on our dams is likely to threaten our assets it is only reasonable we are consulted about it. We are currently investigating the issue further, and will work with the relevant authorities with a view to providing a solution that will reduce any impacts on fish and fish habitat in the future. We would like to thank the guys who brought this to our attention and worked quickly to limit the number of fish deaths. As the eyes and ears on the water across WA, it’s great to see rec fishers willing to stand up for these fish.